The sun sets over crude oil storage tanks at the Juaymah tank farm, operated by Saudi Aramco, in Ras Tanura, Saudi Arabia, on Monday, Oct. 1, 2018. Oil extended its retreat as investor appetite for risk assets shrank and uncertainty persisted over how much OPEC will need to cut output to counter booming U.S. shale supplies. Futures in New York lost as much as 2.3 percent, after falling for the first time in 10 sessions on Friday. Equities slipped on Monday after the S&P 500 Index closed flat Friday, before a slew of bank profit reports and company earnings. Worries that global growth may be slowing amid a U.S.-China trade war and a partial American government shutdown also weighed on investor sentiment. 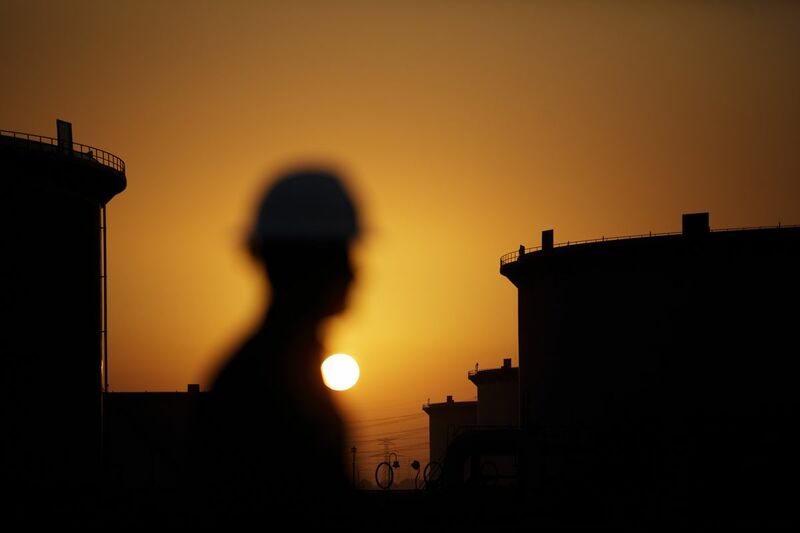 In the oil market, Saudi Energy Minister Khalid Al-Falih said the OPEC+ coalition that’s cutting output to shrink a glut will do more if needed and that the curbs are a “lifeline” to U.S. shale drillers. Crude is down more than 30 percent from a four-year high in October even after a rally into a bull market earlier this month. While the boss of Italian producer Eni SpA and Oman’s oil minister see the latest rebound holding, doubts persist over demand. West Texas Intermediate for February delivery declined as much as $1.16 to $50.43 a barrel on the New York Mercantile Exchange, and traded at $50.91 as of 8:51 a.m. local time. It lost 1.9 percent on Friday, snapping its longest rising streak in nine years. Prices still ended 7.6 percent higher last week. Brent for March settlement fell 62 cents to $59.86 a barrel on the London-based ICE Futures Europe exchange, after gaining 6 percent last week. The global benchmark traded at a premium of $8.58 a barrel to WTI for the same month. Stock markets dropped in Europe and Asia on Monday while U.S. equity futures also declined. Citigroup Inc. gave investors the first look at how Wall Street banks fared during the violent market swings at the end of 2018, reporting a 21 percent plunge in revenue from fixed-income trading in the fourth quarter. Goldman Sachs Group Inc. is also scheduled to publish results this week. Topping the list of investor concerns is the trade friction between the world’s top two economies, which threatens to bring about a demand-crimping global growth slowdown. China is seeking to resolve its spat with the U.S. this year, Commerce Minister Zhong Shan said in an interview after three days of talks. Chinese Vice Premier Liu He is set to visit Washington for further trade discussions later this month. Meanwhile, the partial U.S. government shutdown, now in its fourth week, also continued to pull down market sentiment. A security checkpoint at Houston’s main airport closed as the impact of the shutdown broadened.